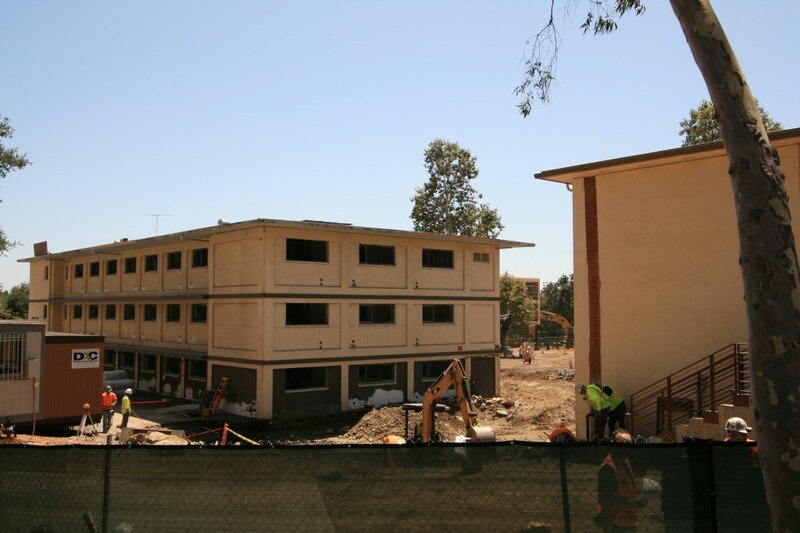 Benson (left) and Berger Halls under renovation on Claremont McKenna's campus. Phillips, Beckett, and Berger Halls were renovated Summer 2013, with Beckett completed in early 2014. For the current second phase, renovation of Benson and Marks Halls is underway with a Marks addition and a Berger/Benson Annex to be completed in early 2015. A final third phase will be completed during Summer 2015 and will focus on landscape, hardscape, and exterior lighting within and around the Mid Quad. “The interior renovation of the rooms, hallways, and bathroom come with sustainable heating and cooling, updated technology, and a warm and welcoming set of colors and finishes. We want students to think of their room and residence hall as their home,” says Vos. CMC students worked closely with Pfeiffer Partners to come up with plans that would appeal to their peers. That student input came as a result of a focus group called "The Mid Quad Renovation Committee," comprising CMC students (including Resident Assistants) who have lived in the residence halls and ASCMC representatives. The group convened several meetings to gather input and then met with the architects, as well as with some deans and other facilities managers. “Through these collaborations with students, we conceived the main social lounges to serve as both a “home-y, living room-like” space by day that can easily convert into a social space for student events by night,” says Vos. “In addition, we incorporated a few group study and quiet study spaces throughout the renovated Mid Quad to meet the academic needs of CMC students. Finally, we are building two music practice rooms in the Marks Hall basement where individual students or music groups can go to rehearse and record their music.” Read more on Mid Quad construction.